Serving as de facto headliners before the main stages opened up on day two, Alabama Shakes drew the weekend's most impressive crowd at a side stage. With This Tent packed to capacity, an overflow audience sprawling way beyond the barricades of the tent itself, the Southern rockers definitely had big shoes to fill. The set kicked off with "Going to the Party," before the Athens, AL band launched one of the festival's biggest sing-alongs with "Hold On." 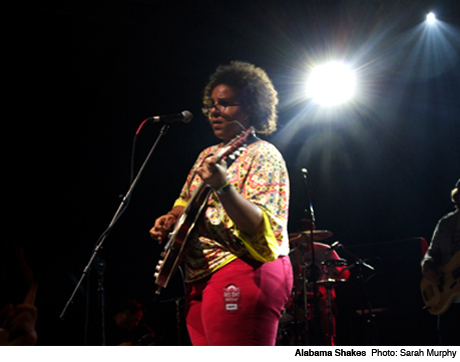 Frontwoman Brittany Howard is amazing to watch -- with a voice that's both effortless and soulful, she shone when she abandoned the guitar to strut about the stage, while the rest of the band kept pace. Closing out the night with Howard practically growling the vocals to "Heavy Chevy," Alabama Shakes established themselves as a group that will probably be back at Bonnaroo in the future, but on a much bigger stage.